Purchased from Ma Chiu Man, Lok Yu Teahouse, Hong Kong, c. 1968. The two-character signature, San Song, is the alias of the renowned bamboo carver Zhu Zhizheng, who was primarily active during the Tianqi and Chongzhen periods, although some records indicate that he may have worked into the early Qing dynasty. See Ip Yee and Laurence C.S. 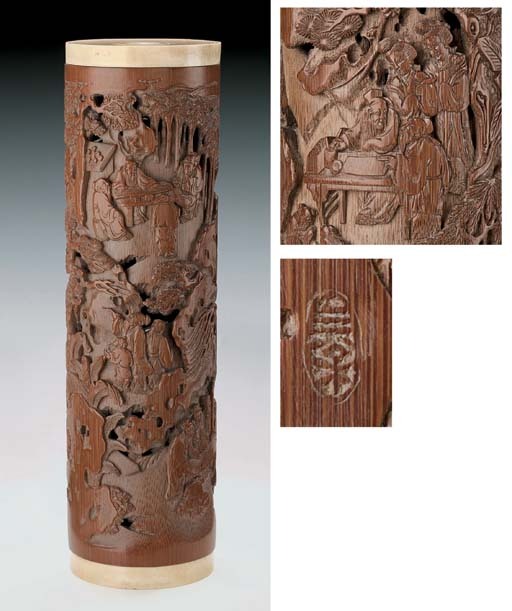 Tam, Chinese Bamboo Carving, Part II, Hong Kong Museum of Art, 1978, pp. 60-2, for a further discussion on the artist. A signed brushpot in the Hong Kong Museum of Art is illustrated op. cit., Part I, p. 204, no. 37. See, also, an ink tray by the artist dated to the Wanli to Chongzhen periods illustrated by S. Kwan, Ming and Qing Bamboo, University Museum and Art Gallery, The University of Hong Kong, 2000, no. 10.